Jan Pieterszoon Sweelinck in 1606. 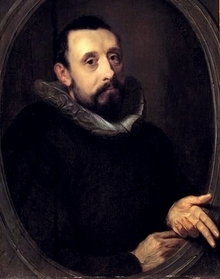 Jan Pieterszoon Sweelinck (May 1562 in Deventer - 16 October 1621) was a Dutch composer and organist. Sweelinck (pronounce: ZVAY-link) lived at the end of the Renaissance and beginning of the Baroque periods. He was one of the greatest organists and composers of his day. He was the organist at the Oude Kerk (“Old Church”) in Amsterdam for 44 years. Many musicians travelled a long way to Amsterdam to hear him improvise at the organ. He composed music for the organ and harpsichord as well as vocal music. ↑ "Jan Pieterszoon Sweelinck". Classical Net. Retrieved 14 December 2011. This page was last changed on 23 January 2018, at 17:26.